High on a ridge between the lake and the bay poet-bard Terry Wooten wrestled 88 boulders into a triple ring and built a firepit in the center. For 25 years other poets, storytellers, musicians and listeners have gathered there to share their latest pieces or revisit classic favorites. Regulars include Jim Ribby, Louan Lechler, Steve and Deb Marsh, Justin Trapp and occasionally Chris Bzdok, a Traverse City attorney with a poetic side! The early evening is child-friendly. Terry, who has memorized more than 500 poems, tailors his performance to the audience, and can mesmerize a wide-eyed three-year-old or a skeptical adolescent. As the little ones are carried home to bed, performers are free to address more complex adult themes. Stone Circle is open to the public on Saturday evenings throughout the summer, from mid-June to the week after Labor Day. 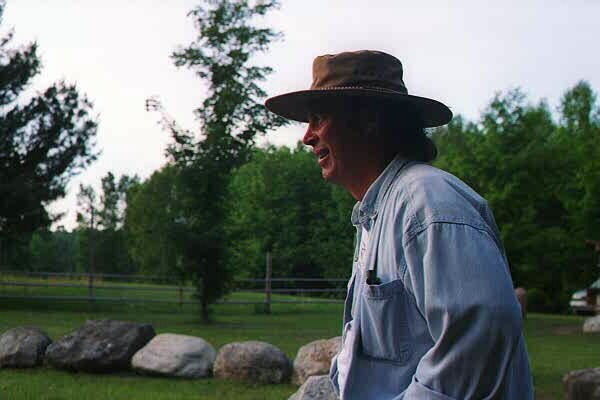 Stone Circle books and CDs are widely available in northern Michigan bookstores, and Terry is available to conduct writing, poetry and oral history workshops in schools all across Michigan and beyond. Edit 7/5/08: The Detroit Free Press published a good story today – you can read it here.